Forget ham. Forget roast beef. Forget pork loin. If you want to make things all right with the world this Christmas, you need to have Chinese turkey—aka: Peking duck. The first step to making a proper Peking duck is bird selection. This, unfortunately, was something I ignored until after I was home and found out I had purchased the wrong breed. 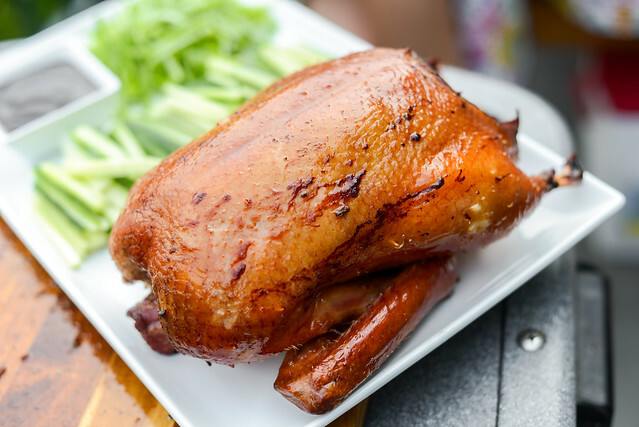 Part of what makes Peking duck work is the thick layer of fat on Pekin, also called Long Island, ducks that renders during cooking and helps create an intensely flavorful skin. 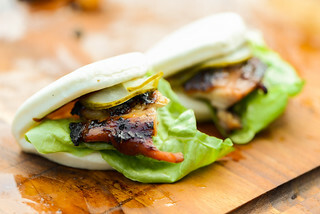 Pekin also has a mild flesh, which makes it pretty universally enjoyed and works well with the simple accompaniments of cucumbers, scallions, and hoisin in final rolled pancake form. I, on the other hand, bought two Mucscovy ducks. I went to the Asian mega-mart, which had a large variety of birds to choose from. Since I was feeding a crowd, I decided to buy the ones with the biggest breasts, which is a trait of the Mucscovy. What I didn't know at the time was Mucscovy also have a relatively thin layer of fat compared to Pekins, and they're more flavorful, which makes them veer towards gamey on some people's palates. I wallowed in my mistake for a minute, but I had mouths to feed, so I soldiered forth, determined to make the best Pekin ducks I could despite my initial error. To do this, as I find myself doing with most things I cook now, I employed the knowledge of J. Kenji Lopez Alt, who had tested and documented a step-by-step procedure for perfect home-cooked Peking duck. After removing the heads that were still attached—I didn't want my ducks to be smiling at my guests—the process started with separating the skin and fat from the meat of the breasts. I carefully slide my fingers under the fat to get this started, then used the end of a wooden spoon to finish the job for the areas my fingers couldn't reach. Take care in this process because it's easy to poke a hole straight through the skin, which I ended up doing on both of my birds. Next step was to coat the bird in a mixture of maltose and soy sauce, which aids in the creation of Peking duck's trademark sweet and savory skin. 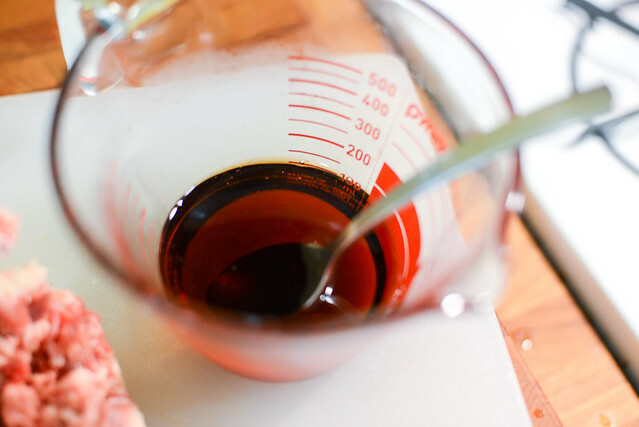 Maltose, a liquid sugar made from linking two glucose molecules, is hard stuff to work with. Right out of the jar, it's incredibly thick and super sticky, so be prepared for the inevitable mess that comes with working with it. To get it into a spreadable form, I microwaved it quickly, which changed its consistency to be more like honey—an ingredient that can be substituted for maltose if you'd like. After spreading the maltose-soy mixture all of the birds, I sprinkled them with a combo of kosher salt and baking powder. 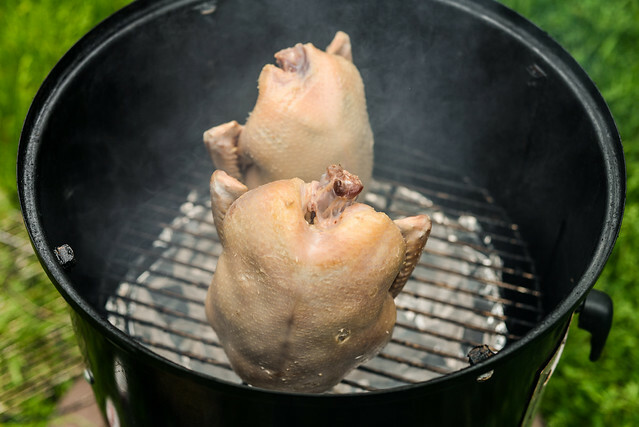 Baking powder is something I'v been using for years to get a super crisp exterior on my grilled chicken wings—it promotes both browning and getting a textured and crunchy skin. Now it was time for the long air-drying process, which was another important step required to remove surface moisture in an effort to achieve maximum crispiness. I stuck my two ducks on wire racks—to allow air to circulate all the way around them—and let them sit in the fridge for 36 hours. After which time, the skin developed a dry, leathery appearance that was a tell tale sign they were ready for cooking. As a kid, I used to love when my family ordered Peking duck, not so much for the duck, which I did like, but for the Mandarin pancakes, which I really loved. Luckily, I learned these are pretty easy to make at home a while back, and have done them a few times previously withe great success. 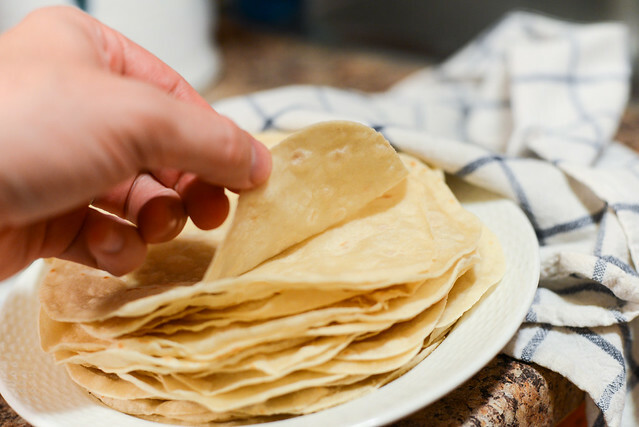 The dough takes just a minute to make and is merely a mixture of flour and hot water that's combined, kneaded until smooth, and split into little balls to make the right size pancakes. Then two balls are rolled out into 3-inch discs and one disc is brushed with a thin layer of sesame oil—this gives the pancakes their lightly nutty flavor. One disc is then rested atop the other and the two are rolled out together as thin as possible. With such a soft dough, it's pretty easy to get these paper thin—when I roll them out, they're so flat that I question if they're still two separate pancakes. 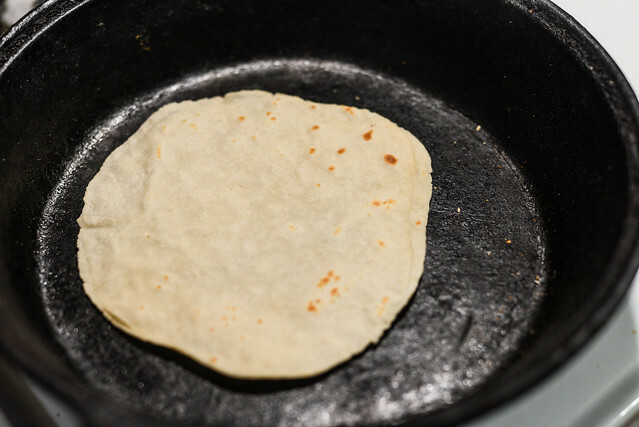 Then, just like with making tortillas, the pancakes are cooked in a dry, hot cast iron skillet until faint browned spots develop on each side. This only takes about a minute on the first side and then 30 seconds on the second. 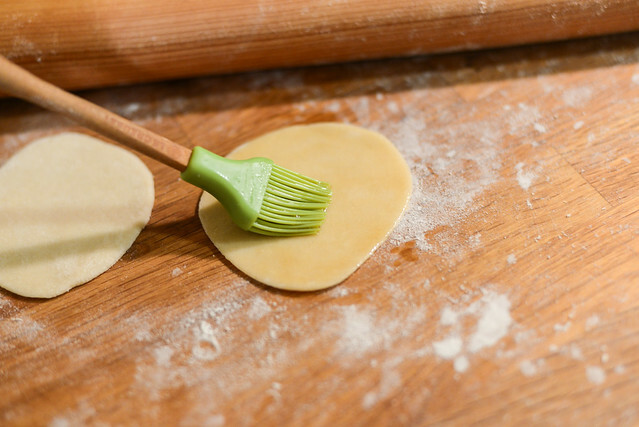 Once they're cooked, the two pancakes are separated and kept warm under a dish towel as the process is repeated with all of the dough. 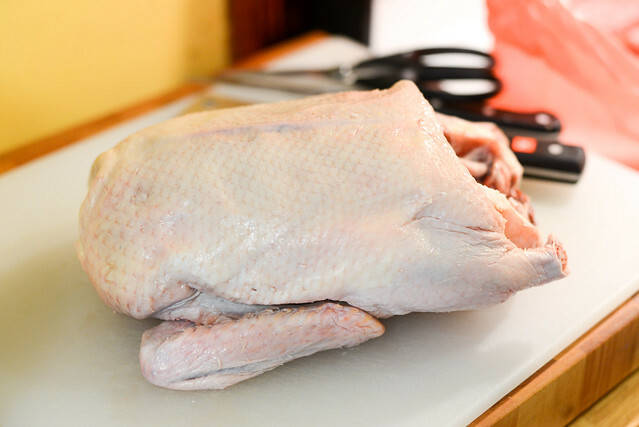 After the air drying of the duck is complete, it's traditionally dipped in boiling water to get the loose skin to tighten back up. Instead of waiting for an entire stock pot of water to boil to complete this step, I used Kenji's advice and placed the rack with my ducks in the sink and then poured boiling water all over them. Now they were ready for cooking, and I couldn't think of a better device for the job than my Weber bullet. I fired the smoker up to 350°F by using a full chimney of charcoal and leaving the water pan empty, but lined with foil for easy clean-up in the end. I situated the two ducks vertically in the smoker using the beer-can method. 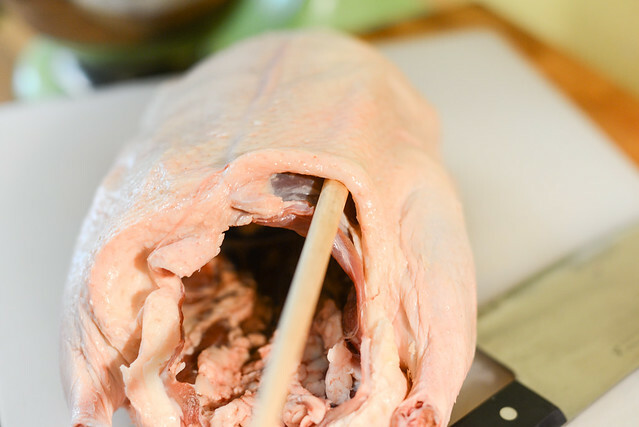 Inserting a tall boy into each duck's cavity and roasting them standing up creates a large escape route for the rendering fat through the edges of the skin around the cavity. After an hour in the smoker, the ducks were beautifully golden brown and the meat was sufficiently cooked. My only problem with the birds were they weren't as crispy as I was hoping. Because I had my grill already going, I decided to throw both of them on it, placed over indirect heat. The quick stint with a hotter fire didn't totally fix things, but did bring a bit more crunch to the skin, albeit not to nearly the same degree I'm used to getting at good Chinese restaurants. All-in-all though, they were pretty impressive birds and had the hallmark looks of a Peking ducks, especially when presented on a platter with all the fixings—cucumber matchsticks, sliced scallions, hoisin sauce, and the Mandarin pancakes. Because the skin wasn't quite right, I didn't remove it and serve it detached from the meat as per tradition. Most slices of breast had skin attached though, ensuring there would at least be a piece in each final pancake. The meat itself was more flavorful than I'm used to because of the use of Muscovy ducks rather than Pekins, but this was something most of my guests enjoyed. It kind of made up for the fact that I slightly overcooked it and it was a tad drier than ideal. Still, with the full line-up of toppings wrapped up in pancake, this mainly tasted like pretty damn good Peking duck, which was an accomplishment for something that comes with a notoriously involved and difficult cooking process attached. I think it's totally within the realm of the normal home cook and makes an excellent alternative, or addition, to the more traditional holiday roasts. 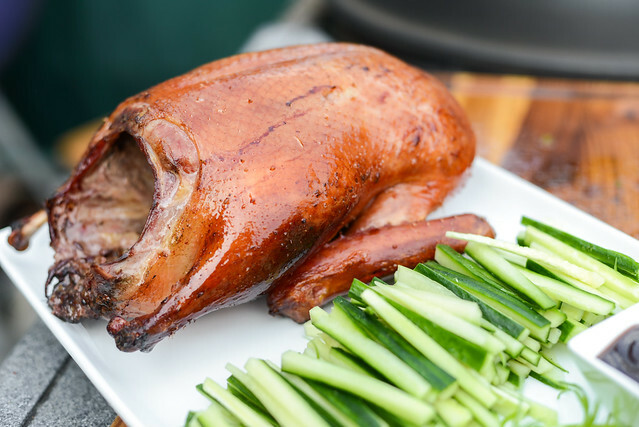 Great Peking duck is within the reach of the average home cook, and using the grill or smoker just makes it all the better. For the Duck: Pat duck dry with paper towels. Insert fingers or dull end of a wooden spoon between breasts and skin and slowly separate the two, being careful not to tear skin. 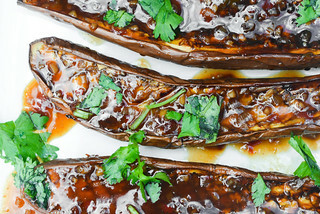 Place maltose or honey, soy sauce, and 1 tablespoon of water in a small microwave-safe bowl. Microwave on high until maltose is softened, about 20 seconds, then stir together until thoroughly combined. Spoon mixture onto duck and rub over entire surface, coating all exposed skin. Combine salt and baking powder in small bowl. Sprinkle evenly over all surfaces of duck. 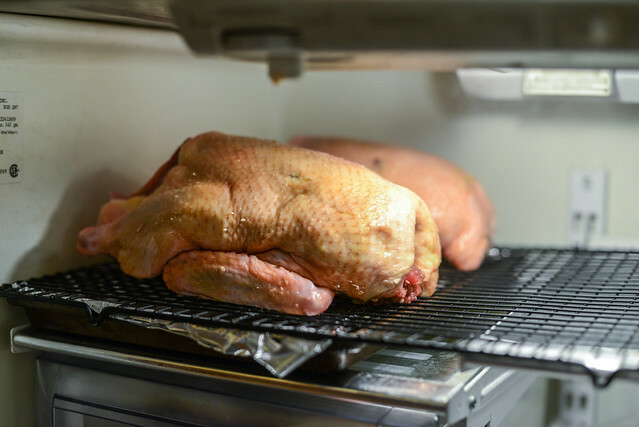 Refrigerate duck, uncovered, 12 to 36 hours until surface is dry with a leathery appearance. For the Pancakes: Combine flour and boiling water in medium bowl and stir with wooden spoon until dough forms. Turn dough out onto floured surface and knead until smooth and elastic, about 5 minutes. 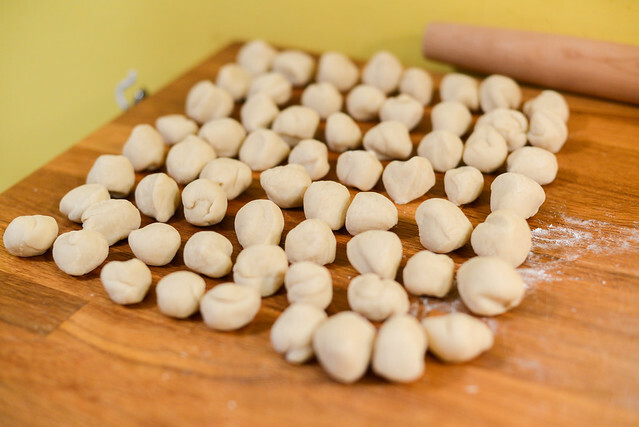 Cut dough into 24 even pieces about 1 tablespoon each. Cover with damp towel. 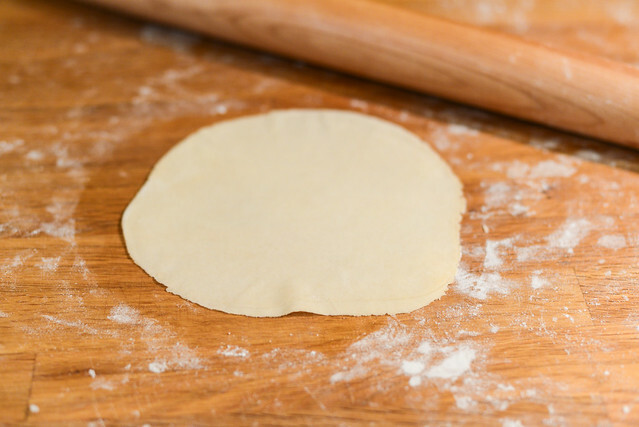 On floured surface, roll one piece of dough into a three-inch circle. Repeat with a second ball. Brush top of first disc with a thin layer of sesame oil. Place second disc on top of the first and roll out into a circle as thin as possible, 8 to 10-inches. Preheat heavy-bottomed 12-inch cast iron or non-stick griddle pan or skillet over medium-high heat until hot. Place pancakes on griddle and cook until lightly browned in spots on first side, about 1 minute. Flip and repeat on second sides, about 30 seconds longer. Transfer to plate lined with clean kitchen towel and carefully peel pancakes apart. Fold towel over cooked pancakes to keep warm and repeat with remaining dough balls. Bring 4 quarts water to a rolling boil in a large stockpot. 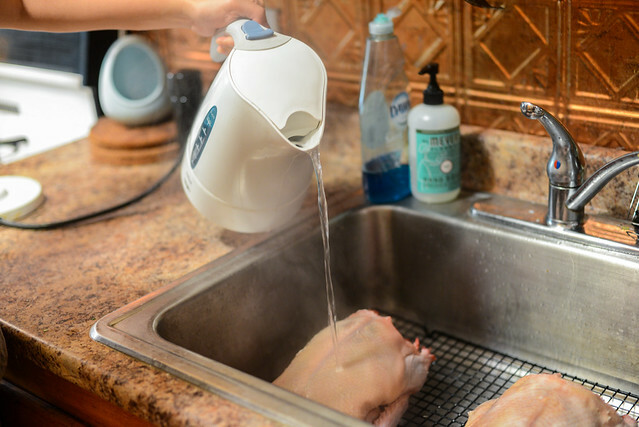 Place duck on wire rack set in sink. 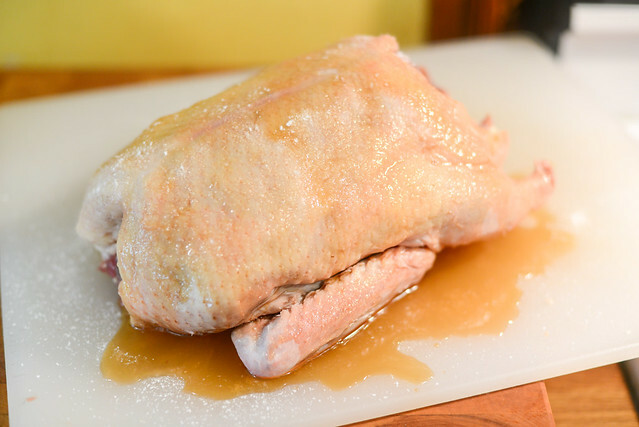 Pour half of boiling water over top surface of duck, making sure to cover skin evenly. Flip duck and pour remaining boiling water over second side. Allow duck to dry 5 minutes. Fire up smoker or grill to 350°F. Stand duck vertically by inserting beer can into cavity. 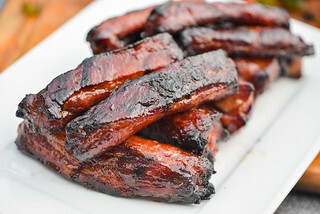 If using a vertical water smoker, such as the Weber Smokey Mountain, leave water pan empty and place duck on lower rack. 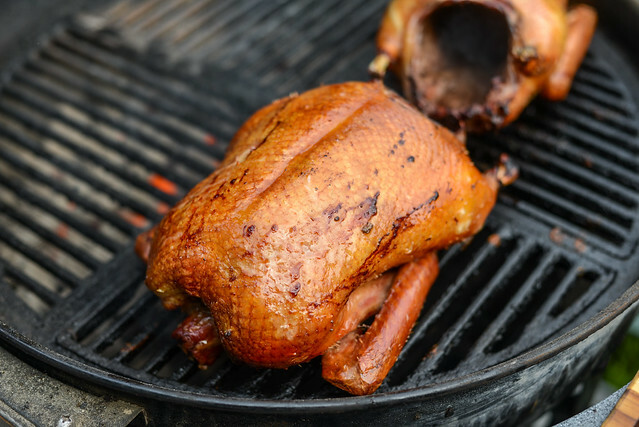 If using a grill or offset smoker, place duck over indirect heat. Cook duck until skin is a deep mahogany, about 1 hour. For crisper skin, add a fresh batch of coals to grill or smoker and continue to cook at high temperature for 10-15 minutes longer. 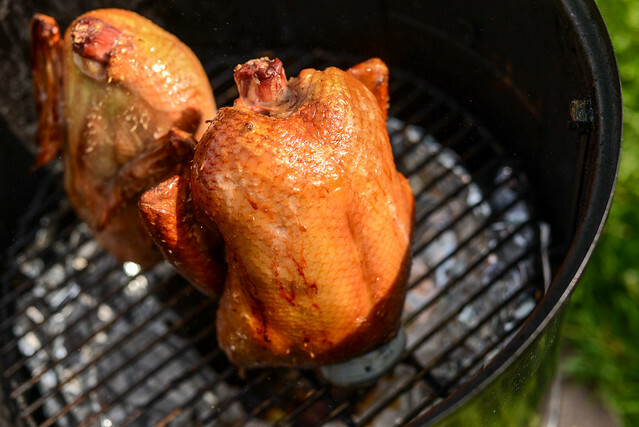 Remove duck from smoker or grill and let rest for 10 minutes. Carve duck, making sure to remove all skin. 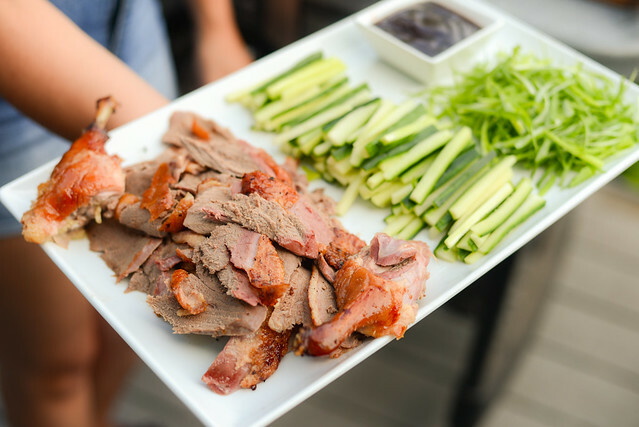 Serve duck with pancakes, scallions, cucumbers, and hoisin sauce.